There are many benefits of using packing organizers when travelling. Travel packing systems make packing less of an ordeal. Travel organizers allow you to make better use of the limited space in your bag. You can fit more into your bag and your belongings are better protected. They also help you to stay organized when packing, as well as when travelling. Do You Really Need Packing Organizers? “Packing cubes are like an iPad, do I really need them? No. We have used number of different packing organizers over the years, i.e. packing cubes, packing folder, toiletry kit, shoe bags, gadget cases and compression bags. We could pack our bags without using travel organizers but we don't want to as they help us to stay organized when travelling. Items from our travel packing system have been on all our trips since we got them and they will continue to travel with us. How To Use Travel Organizers? Travel packing systems include organizers in different shapes and sizes. There are number of travel packing system brands available. The look and quality may vary but most work on similar principles and include similar type of products. Popular packing aid items include packing cubes, folders, sacs, shoe bags, gadget cases, toiletry kits, medicine cases, travel bottles, jewelry cases, tie holders, and compression bags. This video shows how to use the Eagle Creek Pack-It organizers. Other travel packing systems work in similar manner. The Benefits Of Using Travel Organizers? Moreover, you can continue to use them when back home. Travel organizers come in different shapes, sizes and colors. This gives you great flexibility when packing your bag. You can use the different organizers for different things. Packing cubes are great for casual wear, socks, underwear and small loose items. While packing folders are great to protect your formal attire (shirts, dresses) from wrinkling. The same item can also be used in more than one way. For example, compression bags compress your clothes so they take less space in your bag but they are also great for dirty laundry on the way back. Family members can have their own color of organizers. This allows you to easily extract the right packing cube from your bag when needed, e.g. if someone gets wet or cold. If you are struggling to fit everything you need in your bag, then packing organizers are for you. Organizers compress your belongings, allowing you to fit more in. 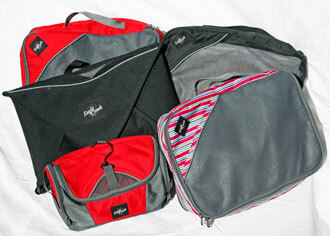 Travel organizers fit easily into any bag. It is easy to stack them and because of their shape, there are less awkward empty gaps (that can be difficult to fill). Organizers are also great core object if you use the efficient Bundle Wrapping packing method. Using travel organizers helps protecting your belongings in number of ways. Storing potential damaging objects (e.g. sharp, leaking) separately reduces the risk of damage while travelling. Packing organizers are also useful to separate used and dirty items from the fresh and clean ones (also great when going through security, no dirty laundry spilling out of your bag). And if you can do with more space but less wrinkles, then packing folders are for you. As you can imagine, packing folders are very popular among business travelers. Travel Organizers can help you to stay organized when travelling. They are especially useful if you are moving frequently between places, e.g. staying few nights in each place. You can then use the organizers to avoid having to unpack your whole pack. Just pack your belongings into suitable sized organizers and extract those you need from your bag when you need them. This is easy to do and you will not have to pack and unpack every time you move between places. We have often used our packing cubes like this and we love it as it saves both time and hassle. We use our packing organizers not only when travelling. We also use them at home for storing various loose items. The packing cubes fit nicely into drawers and cupboards. Amazon offers one of the largest range online for packing organizers and best prices. Use the Search Bar below to search for yours.